Leukemia Fighter! 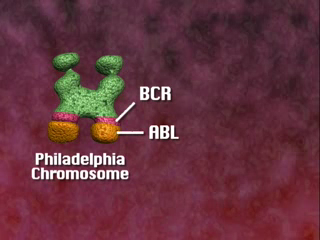 (CML); I Am Dancing and Traveling My Way Through: What is the Philadelphia Chromosome? 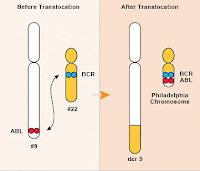 Until recently I had never heard the term “Philadelphia chromosome.” It wasn't until I was diagnosed with chronic myelogenous leukemia, almost two years ago, that it became a part of my vocabulary; it has now taken temporary control of my life. This condition is not something that I was born with or something that I can, or will pass down to my children. It is not contagious; so you needn't run when you see me coming or wear garlic around your neck. It is my understanding that CML is just kind of a fluke. Lucky me! I must admit that I do often wonder whether or not there is some sort of environmental phenomenon that causes some of us to develop CML or if it really is just a fluke. It seems that the longer I have CML, the more people I meet, that do not fit "the CML profile", so what do "they" really know about it; beside the fact that they have found a way to control it; at least for many of us. 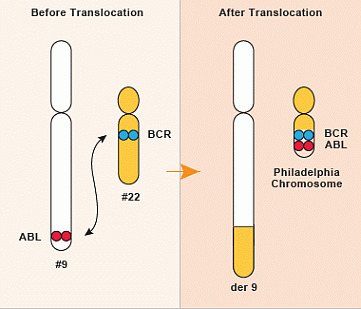 Great description of how CML is developed. across the web. Shame on the search engines for not positioning this put up higher! I have a quick question about your site! Please email me when you get a chance. Hi! I could have sworn I've been to this blog before but after browsing through many of the posts I realized it's new to me. I have Graves disease and took radio active iodine back in 1995. I had breast cancer in 2006 had chemotherapy and radiation. Then in 2012 was diagnosed with leukemia. I don't know if there is a link between radiation (and for that matter the type of chemo I had) and leukemia but if there is I sure have one. My oncologist said it is just my bad luck. Not what I wanted to hear.